There are a few differences when between playing craps online and in an land-based casino. For starters, playing online is more convenient and less stressful, which makes it ideal for players that haven’t played this exciting game before. Not only can you play from the comfort of your own home, but you’re also able to take advantage of many bonus offers that will fatten up your bankroll. Let’s take a look at the differences and then you can decide for yourself which is best. When you play at a land-based casino there’s a certain element of etiquette which must be followed. Players need to know when they’re allowed to bet and should avoid using the jinx word ‘seven’. It’s also frowned upon if players openly celebrate after a winning result after betting against the shooter. And these rules are just the tip of the iceberg! But the great thing about playing craps online is that you don’t need to worry about any of these etiquette rules because it’s just you against the house. Live dealer games are also much more laid-back, which takes a lot of pressure off you, so that you can focus on your game-play. When you play at a land-based casino it’s customary to tip the dealers, and this adds up at the end of the day. However, when you play at an online casino you needn’t tip because the dealers are automated software. That being said, if you opt for the live casino variation, many offer such an authentic experience, they even include tipping to give a better feel of the brick and mortar caisno environment. But at the end of the day, whether you tip or not is entirely up to you. In live games craps, you need to throw the dice in a certain way. It has to hit the wall at the far end of the table and there’s casino staff that makes sure you don’t slide the dice along the table. Alternatively you can set them in such a way that they don’t bounce. This can be incredibly nerve-racking especially if there is a massive crowd watching – which is usually the case. When you play online, you throw the dice with a click of your mouse, so all the stress and anxiety is eliminated. The other fantastic thing about playing online is that you’ll be able to enjoy many different variations of craps. Before the internet revolutionized the casino industry, variations of craps were customized to specific regions, but because online casino players can play from anywhere in the world, these different variations have now become accessible to all. If you’ve never played craps before, you can start by playing for free. You must remember that you won’t be able to win any money, but it’ll give you the opportunity to get to know the rules of the game. As soon as you’ve gained enough confidence you can open a real money account and start playing to make profits. The great thing about real money craps is that you’ll be able to take advantage of many different bonus offers. When you open an account you’ll most likely be offered a Sign-Up bonus. Usually, there’s no deposit required, which means that you’ll be able to test the waters for free. When you’re confident enough to make a deposit, you’ll be able to get great value for your money if you take advantage of a Match and Reload Bonus. A Match Bonus is when the casino will match a percentage of your deposit amount up to a maximum amount. For example, if it’s a 100% Match Bonus and you deposit $20, you’ll get $20 bonus money. If you’re going to make more than one deposit, the Reload Bonus will be right up your alley. This is when the casino will match your deposit amount for a number of deposits made consecutively. And you also get Daily Bonuses, Sticky Bonuses, Loyalty Bonuses, Cashback bonuses and High Roller Bonuses, to name but a few. Bonus offers are never-ending, which means that you’ll be able to play for longer. There are many reasons why you’ll find many High Roller players at the craps table, with the most obvious being that craps have the lowest house edge of any game played at an online casino. This means that your chances of winning are better, and because of this, players are willing to take bigger risks when playing craps. As with any other game, it’s incredibly important to get to know the rules before you start wagering your money. Different casinos will have different betting options so it’s important to understand the basics. The Pass Line Bet has a house edge of just 1.41%, which makes it a premium bet. Why? For the same reason you should go for the Pass Line Bet. It also has a house edge of only 1.41%, which means you can’t go wrong. 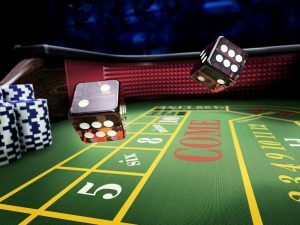 Many players believe that this goes against the rules of craps, but in actual fact, it also has a very low house edge of 1.40%. You might be thinking that you’re reading double but the Don’t Come Bet has the same house edge as the Don’t Pass Bet (1.40%) …so go for it! Want to try your luck in a good game of online craps? Then be sure to click here!